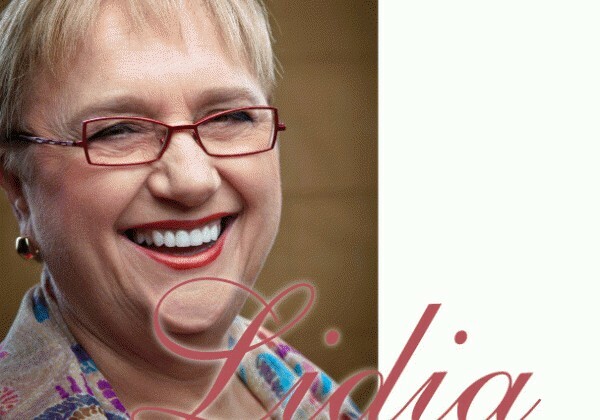 You could argue that Lidia Matticchio Bastianich did for Italian cooking what Julia Child did for French cuisine: She made it seem accessible and fun and, through her books and public television shows, wove it into the fabric of American life. Unlike Child—who first put Bastianich on TV—she started her life in Europe. Born in 1947, she grew up in Istria, formerly a part of Italy but now shared by Croatia and Slovenia. At 12, she came to the United States with her family and settled in Astoria, Queens where she got her first job at—of all places—a bakery belonging to Christopher Walken’s father. In a cozy interview with Long Island Pulse, she talked about her relationship to the Walkens and to Queens—which she considers part of Long Island and where she still lives, in Douglaston, with her 91-year-old mother. As we sat mid-afternoon on the quiet second floor of Felidia, her flagship Manhattan restaurant, she offered espresso and pastries with the warmth she displays on television. Voluble and enthusiastic, she also exhibited the savvy about food and business that have made her a successful restaurateur and media personality. 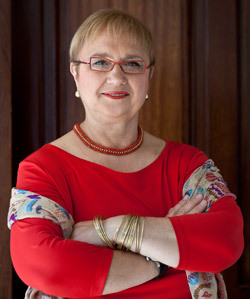 She spoke with particular pleasure about her five grandchildren and two children, Joseph Bastianich and Tanya Bastianich Manuali, who are also business partners. We started with an update on Eataly, the Fifth Avenue market and restaurant emporium that she shares with Mario Batali, Oscar Farinetti and her son. About a year ago I was interviewing Mario Batali, when Eataly had just opened, so I’m wondering how that’s going. It is going extremely well. We’ve been adding different things, new food experiences. Everything just sells. We sell rabbit, you know. I was surprised. I asked how many—and it’s 10 to 20 rabbits a week, which is a lot. So the economy doesn’t play a part when people buy specialty items? I think that people understand the value of product. They are much more willing, as one does in Italy, to pay and to eat a smaller amount. The deliverance of flavor is so intense that if you eat 10 times the amount of another food, it wouldn’t have the same message. And you are the dean of La Scuola, Eataly’s cooking school? I love educating. It’s gone so well that we’ve rented additional space. How early on did you start doing demonstrations in your restaurants? I opened my first restaurant in 1971. I was rather young and not really a full-fledged chef. So we hired an Italian-American chef and I became his sous chef. That’s how I got into the Italian-American cuisine and understood it. Then I said, “I really need to cook the stuff I eat at home. I need to make the gnocchi. I need to make the fresh pasta.” So in the restaurant, my mother would give a demonstration, how to make the fresh pasta, and then the customers would order it and taste it. It was my mother, my aunt or myself. Even here, the chef comes out and demonstrates. The customers see and they taste. Are there customers you’ve become friends with? Oh, sure, along the way you get involved in people’s lives. You get invited to their weddings and their christenings. There are business relationships, too. The way I got into books was with Jay Jacobs. He wrote for Gourmet magazine; he’s passed away since [in 2008]. He gave me a wonderful review. He lived nearby and would come and ask questions. He said, “You know, you have some wonderful information that an American would like to know. You should write a book.” I said, “I’m no writer. But I’ll write it and you do it with me.” My first book [La Cucina Di Lidia, 1990] was a collaboration with him. My television series—James Beard and Julia Child would come here, and she said, “Lidia, I would love for you to do a show with me.” We did two actually [in 1993], for her Master Chefs series. From that, a television producer asked me if I wanted to do my own show. So that’s how you got your start. The restaurant is a grand place, socially and businesswise. In our case, it was family, so it gave me an opportunity as a woman to be able to work and still have my family. If we worked late, my mother came and we ate, and then she took the kids home. Now both my children are involved in my work. Did you not want that at first? No, not really. Actually, I was afraid. I wanted them to go on to college and get an education. I wanted them to get a real job, not a restaurant job. So I would tell them, “This is not what you want. I love it, and the restaurant makes us a good living. But you children, you have the opportunity to get your education.” And you know, they did. My son went to college, got a master’s, became an analyst for Merrill Lynch. And ultimately he decided he wanted to apply his newly learned business acumen to our business. My daughter, on the other hand, was an academic. She went to Georgetown and ended up with a PhD from Oxford in England in Renaissance Art History. And now she helps me with the research and the development of the shows. She brings in historical facts. She wrote the last three books with me. She also helps me with other things, with a line of ceramic bakeware that we do on QVC. Food is an opportunity for endless connecting and for having a passion. Food opens doors. Given that it opens doors, it sounds as though you’re not sorry your children followed in your footsteps. Oh no. I just wanted them to get an education. In this new book, I write about the Italian philosophy of life, about the generations. I always say I have two of the greatest cultures. I was born Italian—great creativity and flavor and design—and I adopted the American, because I feel just as much American. I have the American business know-how, the organization. You put them together, and that’s my success story. Could you elaborate on the Italian philosophy? Why does everybody want to be an Italian? I think it’s because the Italians are always congenial. It’s important to them that they live well. It means being secure, being surrounded by friends. It means having great culture, great music, great art, great design, smelling good, looking good, eating good, social interaction. And you think other cultures don’t have that? I think a lot of other cultures have different priorities. America is such a young country. There was so much natural wealth and all these minds wanting to make things happen. It’s like a river of industrialism that prevailed. So how do you stop a river to smell the coffee? I think it’s happening now. Did you ever think you would become this successful? No, I never thought that what I had to say was so compelling and would become so important in America’s life. I think it has all been magnified by these opportunities, books, television and now the Internet. How do you relate to your daughter and son at work? I get asked that a lot. Family businesses are quite common in Italy, so working with my children continues my Italian tradition. And I think as parents—because I’m American and look at this from the American side, too—we raise our children and we get to mentor them until they go to college and then they go off on their own. I have the blessing of them coming back to me. The one thing I have to be careful about is if I revert to being a mother during business. Have you ever thought about opening anything on Long Island? My first two restaurants were on Long Island. One was in Forest Hills and one in Fresh Meadows. But we ended up in Manhattan. If we include all the businesses, with Mario and all our other joint ventures, we’re talking more than 2,000 employees. And you have restaurants in Pittsburgh and Kansas City. Why those cities? And then there’s Las Vegas and LA [Joe’s restaurants with Mario Batali]. My son wanted to spread his wings. He had the “Go West, young man,” kind of mentality. How did you meet Mario? Was it through Joe? No, I introduced them. I was asked to do the press dinner the night before the James Beard [awards] event, maybe 15 or 16 years ago. And I thought, I’m going to gather all the young chefs and sommeliers who are doing Italian food and doing it well. Mario was at the time a young up-and-coming chef. And my son had just come back to join me, and his passion was wine, so I put him in charge of the wine and sommeliers and organizing. And that’s where they met. But I knew they would hit it off. I was intrigued to discover that you and Christopher Walken were friends in Astoria. How did that come about? I started working in Walken’s Bakery when I was 14. I lied and told Paul Walken [Christopher’s father] that I was 16. He had three boys, and Christopher was the middle boy. They would work there, too, on weekends and the summertime, and we were all friends. They had a summer home on the North Shore, I think around Bayville. I would go there, stay in their house, and we would go waterskiing. We always kept in touch. I admire what he does. He’s a good cook, too. I did a children’s book last year, and they asked me to do two more. I want to bring children closer to the source of food. I was blessed when I was young to have my grandmother, who kept geese and ducks and a goat, and we would grow all our vegetables and we made olive oil, so I have a basic understanding of food from the ground up. And today there’s a disconnect. Children don’t understand. So I’m going to share the things I remember, that I tell my grandchildren when they come over. We all pile into the bed and the first thing they say is “Nonna, tell us a story.” They love the goat stories, the chicken stories, the shelling the peas stories. Being an immigrant seems to be an important part of your life. When you are accepted in a culture and given an opportunity as I have, you want to share. I want everyone to know that if you give someone an opportunity, they will give back. I think what I achieved can happen only in America. Will you be teaching in November? In late October, I am releasing my new book, Lidia’s Italy in America, which follows the Italian culture from immigration into the present, through three or four generations, and how it has really integrated into the American way of life. All my restaurants will have recipes from my book and we will have book signings [including one Nov. 3 at Barnes & Noble in Carle Place]. And the book is related to a PBS series? With the book, there will be 52 half-hour episodes, and they will begin to air in the fall. I do a whole chapter on how pizza took on a life of its own in America.